Exquisite Landscaping maybe we are not big in numbers but we are huge with our experience and knowlage. Experience is the most important aspect in every industry and having that we will choose the best materials and plants to create a unique garden, patio or driveway for You and many more. We have a team of experienced landscapers and our offer range from full garden transformation, through different style patios and driveways, to planting and garden maintenance. 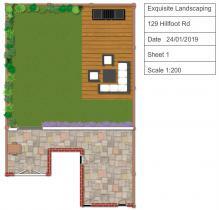 Exquisite Landscaping also provides professional garden design service. Liverpool constitutes our main area of activity but we also cover areas of Cheshire and Greater Machester. We are providing wide range of design from big family gardens through driweways, to small back yards. Every garden design by Exquisite Landscaping is different and unique. Exquisite Landscaping its the only company in Liverpool offering Resin Bound done by our team of experience landscapers. Other companies also offer that service but they will hire a subcontractors to do final finish (resin bound) and thats where all can go wrong.We are fully qualified and traind by the biggest aggregates and resin supplier in UK - Derbyshire Aggregates. Resin bound or other aggregate serfacing such as soft rubber crumb play areas will be fully cover by warranty. Patios and Driveways they are two most common landscaping projects. To build a driveway thats gonna be free from grass growing through, without tram lines and puddles after heavy downpour or creating a nice patio without trips and moving pavings after first winter requires years of experience in groudworks and knowlage in civil engineers. Sub-base preparation is the key and many companies will do a "cheaper job" saving on materials and labour when they prepare a sub-base. Finish patio or driveway will look the same but whats underneath its most important. If You want your driveway or patio to last years Exquisite Landscaping will be the best choice for You.